In anticipation of Neil Young hitting the BIG SEVEN ZERO next week, celebrations are well underway across the continent and around the world. Neil Percival Kenneth Ragland Young turns 70 Nov. 12. As a member of two of rock music's most revered outfits -- Buffalo Springfield and Crosby, Stills, Nash & Young -- his music lit up the Whisky a Go Go on the Sunset Strip and defined the Woodstock generation in the 1960s. 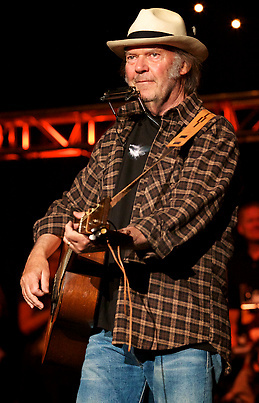 Full article at Neil Young: Still rocking at 70 - Young's years here made lasting impression by the esteemed Winnipegger John Einarson. Be sure to submit comments. Somehow the dear folks in Canada to not appreciate the legendary status of their native son? What's up with that? Oh, Canada, indeed, eh!?!?!? Also, more discussion of birthday celebrations, harvesting, seed justice, and commentary tonight on Thrasher's Wheat Radio. The article is fantastic. There is some great stuff revealed in this article and it is quite enjoyable to read. Neil was playing Americana music in the early, early days. Lots of other gems included. Excellent. Thanks for sharing, Thrasher, and Thrashette. BTW, don't let Mark Zuckerberg bring you down. Good will prevail over darkness in the end. I always hit your site, so, I'm still tuning in. What a great time to be a Neil Young fan! I am eagerly anticipating the arrival of the 2 disc set, Live at the Blue Note cafe. I am thrilled to get an official live release. It has almost all of the songs I enjoyed from that tour by the Bluenotes. Neil is one prolific artist, releasing so much great material at such a pace. He is an Environmental hero and his fight is for the people. He is not one to shy away from a fight with Corporate Satan Monsanto and cronies. He will speak his truth. I am hoping for another album and tour with Promise of the Real. That show was INCREDIBLE!!! Keep on bloggin' in the "Free World"
PS- I love it that Stephen Harper got an Epic Smackdown right after Neil said in the press that he and his Government are an embarrassment to Canada. He was their George Bush. So glad that Sunshine has returned to Canada and the Environment is back on the table. It is OF CONCERN. It is central to our long term goals as a species. Alan in Seattle. Yes, John E does nice work and always has. We're trying not to let Mr Z harsh our mellow as much as he and his minions might try. All is right in love & light.